Growing from a Sales and Letting Business to a multi-disciplinary property group, Romans Group has committed to a strategy of technological investment in order to support its continued growth plans. Since Romans invested in Sage Software its turnover has doubled and is set to increase. Sage 200 provides us with an innovative yet stable platform for consolidating and managing our expanding business, while Pinnacle maximises the value of our investment as a trusted extension of our team. Coming into the twenty-fifth year of business, Romans Group employ around 400 staff in 24 offices, covering London, the east of England, the Home Counties and Wales. In 2011, the Group won the prestigious Sunday Times awards for Estate Agency of the Year and Lettings Agency of the Year and turnover for 2012 is expected to be in the region of £28 million. 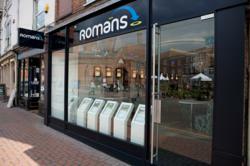 Romans Group has a diverse range of service offerings including estate agency sales and lettings, auctions, financial and mortgage advice, surveying, new homes marketing, land development and town planning, managing such a wide ranging business is no small task. Managing a wide ranging business Romans recognised the need for a solid, integrated and flexible solution was crucial to support the group as it continued to grow. Romans committed to a strategy of technological investment and made the move to the Sage 200 Suite, with specialist module Project Accounting. The software was implemented by local Sage Business Partner Pinnacle. This strategy of being prepared to invest in technology has paid off; since Romans implemented Sage its turnover has doubled and is set to increase. Sage 200 has created a central point for monitoring money entering and leaving the firm across the entire group. Having this central access means the group is able to manage its finances more easily, while higher level management reporting gives Romans the confidence that management decisions are grounded in accurate, up-to-date information. Pinnacle provides wide-ranging support throughout the Romans Group and the ability of the Sage 200 solution to grow in line with the changing needs of the Romans business means that significant untapped potential remains. Continued technological investment and Sage development are therefore key elements to Romans’ growth plans. Plans currently on Romans’ horizon include the automation of purchase order processing group-wide as well as the implementation of the Sage 200 fixed assets tracking module. Pinnacle is a leading Sage Business Partner servicing over 1000 Sage customers throughout the UK and Ireland. Pinnacle supplies, implements and supports the full range of Sage Accounting, CRM and ERP Solutions including; Sage 200, Sage CRM, Sage SalesLogix, Sage ERP 1000 and Sage ERP X3. Six times winners of the Sage Circle of Excellence Award, including 2011, Pinnacle prides itself in providing extraordinary levels of customer service and support.